Posted on 2/23/2016, 2:35 pm, by kittykill, under Tute Tuesday. 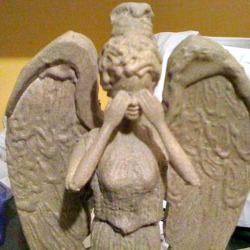 Whatever you do, don’t blink! If you are a Dr. Who fan, you know this might be the best and most frightening character in the entire series. A seemingly innocent statue can eat your face in a matter of blink. Now then…don’t you want to make one for your house? Of course you do and Fayeven is going to show you how. Her tutorial for the Don’t Blink Dr. Who Doll isn’t as complicated as you would think. A little bit of hot glue, some textured spray paint and you have your very own villain. Just remember while it may be fun to make up a bunch of these beauties, DON’T BLINK! This is just one crazy craft you can find on our Miscellaneous Board. Have fun crafting an evil villain or an altered tin, it’s up to you and your imagination!